The truth is that it’s better to dwell in those places than with anyone that’s angry and contentious (likely to cause an argument). Relationships are hard enough without having someone always looking for a fight. I was walking in the woods behind our house today and found this little figurine. I couldn’t believe how applicable it was to real life. 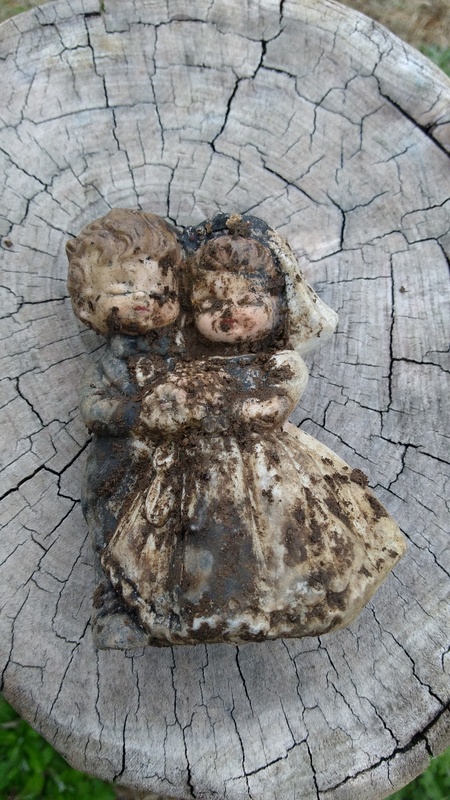 Sometimes our relationships can resemble this…soiled, muddy, polluted, and defiled. During those times, it can be hard to see through the muck to even imagine something that could possibly look better. But I chose to wipe off the figurine, and do you see what I saw? They were still holding hands. With just a bit of effort, I was able to uncover the fact, that underneath it all, they were still connected. Do you believe that’s true for our relationships? I do. Underneath all the mess, there are 2 people that were once connected, and with just a bit of effort, the fact that there is still a connection becomes visible. Inspired by what I saw, I took the figurine inside and cleansed it with some soap and water, and a bit of bleach. The cleansing revealed a couple with a few scars, but look at their faces. They look happy and content again…renewed and ready for a new life. Sometimes, deciding to work diligently to wipe off all the offenses and grime to uncover a renewed relationship can be rough and it can definitely sting. (Just as if being cleansed with bleach) But it’s so worth it. Those scars just make us stronger, and more able to testify to the Lord’s mercy and miracles. 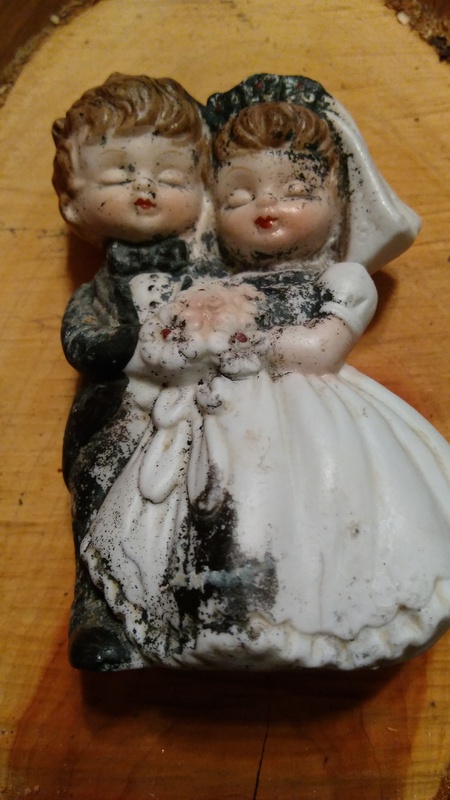 Just like this figurine, there can be new life waiting underneath; we just have to be willing to uncover it. 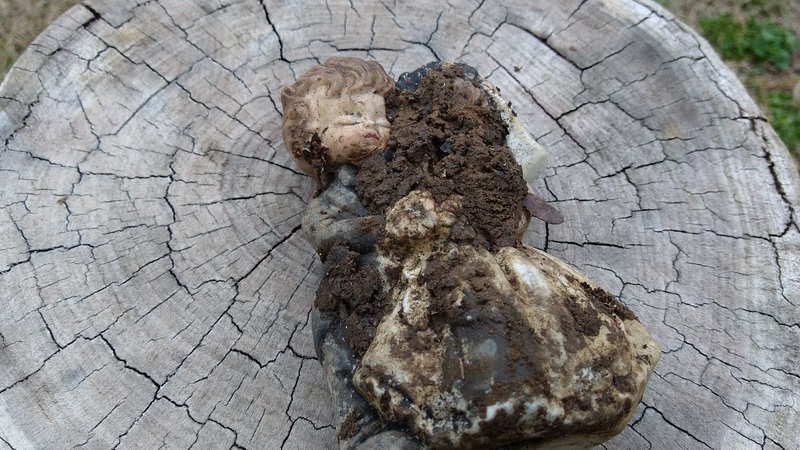 I couldn’t tell you how long this figurine was buried in the mud. It was pretty deep in there, and even under some other trash. But that just proves that no matter how long our relationships have been in the mire, with just a bit of interest and care something beautiful can be revealed. And the most beautiful part for us is that God is faithful to stand with us during the process. Get out that scrub brush! Can anyone attest to the truth of this!? 22 years ago today, my best friend died in a car wreck. It was one of the most devastating days of my life. It wasn’t just because she was gone. Adding to that grief was the fact that at the time that she died, we had been fighting for several weeks. Now she was gone and I’d never get a chance to change that fact. The moment I found out she was gone, none of the issues we’d been fighting about mattered. All I wanted was her. I wanted to go back and tell her I was sorry, that it wasn’t really important, and hug her tight. The fact that I couldn’t, the fact that I had been so stubborn and unforgiving, was something I would have to work through for a long time. My sage advice today is to let it go. If, in the next moment, the person you’re striving with was gone, would it really matter? Before it gets worse, choose to put a stop to it. You never know if you’ll get another moment to show love.